Tama Benton Cooperative - . CORN HIGHLIGHTS: Corn futures were under pressure again today with losses of 3-3/4 to 4 cents as Sep led today's slide closing at 3.71. A new contract low, as well as a new contract low close was triggered in Sep and Dec futures. Nearby May closed 3-3/4 lower at 3.56-3/4 with a low of 3.56-1/4, also a new contract low. Improved weather conditions, a lack of friendly news, and continued pushing by managed money positions growing their record short position kept the market from gaining any traction in today's trade. Last week's Commitment of Traders report had funds at 307,000 short contracts as of last Tuesday, and that position has likely grown through today's trade. The weather front saw favorable forecasts with warmth and drying across portions of the Grain Belt which is allowing for early planting progress to begin. It is estimated that planting progress be around 7% at this stage, but if weather continues to stay favorable, this year's planting progress should improve at a rapid pace. Weekly export inspections did provide some favorable support in the market, as the USDA totaled the 5.3 million bushels off the week ending Thursday, April 18, which is above the necessary levels to meet the USDA's estimate of 2.3 billion bushels for the 2018/19 marketing year. Regardless, the short-term outlook is staying bearish until the market has a better sign of a bottom or some news that could trigger some short covering. SOYBEAN HIGHLIGHTS: Soybean futures also saw 3 to 4 cent losses in today's trade as the front month May contract was down 3-1/2 cents at 8.77, while Jul beans were down 3-1/2 cents to 8.90-3/4. Weekly soybean inspections totaled 14 million bushels for the week ending April 18, which is below the 36.3 million bushels needed to match the USDA's export estimates for the 2018/19 marketing year. Currently, bean exports are trending approximately 28% under last year's levels. The overall concern on the demand side of the equation, as well as ongoing harvest pressure from South America, keeps bean prices on the defensive as prices failed to hold their overnight and early session gains. Brazil harvest is approximately 92% complete on today's numbers, which may bring some lift on hedge pressure from Brazilian producers, but overall U.S. bean supplies staying fundamentally bearish with burdensome totals. In addition, an additional case of African swine fever found in China continue to show the impact of the disease which is weighing on both corn and bean markets with losses of long-term potential demand. WHEAT HIGHLIGHTS: Wheat futures were the heavy selling pressure in the grain markets as Chi contracts were 4 to 8 cents lower. Front month May futures were down 8-1/2 to 4.35-3/4, while Jul Chi wheat was down 6-1/2 to 4.41-3/4. Selling was also seen in the other classes of wheat with KC hard red winter wheat May contract down 8-1/4 cents to 4.11 and Mpls spring wheat May contract was down 14 cents to 5.09-1/4. The market is looking for any type of supportive news but continues to see a negative tone as weekly export inspections were 29.8 million bushels for the week of April 18. This was above the necessary pace to meet the USDA's export total, but total export shipments are down 4% from the previous year as we get closer to the end of the marketing year. In addition, improved weather forecasts across the Plains are maintaining favorable crop conditions in hard red wheat and may help speed up the planting of overall spring wheat acres. On the global scale, the most recent rise in estimates of Russian wheat harvest have put pressure on Russian wheat prices, which are already winning some of the competitive battles on the export front. With overall wheat prices softening, it will be difficult for wheat futures to gain much traction, as well as additional demand from U.S. shippers. CATTLE HIGHLIGHTS: Cattle markets found sellers today as Thursday's bearish Cattle on Feed report was enough to overwhelm some other supportive fundamental factors. The nearby Apr live cattle contract closed 2 cents lower to 128.50, Jun lives closed 1.10 lower to 121.57, and Aug lives closed 97 cents lower to 118.77. May feeders were down 72 cents to 150.80, Aug feeders were down 1.05 to 159.62, and Sep feeders were down 1.30 to 160.77. Choice beef values were up 59 cents on Friday afternoon to 233.65 and were up another 98 cents this morning to 234.63. Friday's choice closes the highest since May 18. Continuing forecasts for warmer weather, particularly on the East Coast, should keep retail beef demand strong and possibly keep cash cattle trade supported as well. 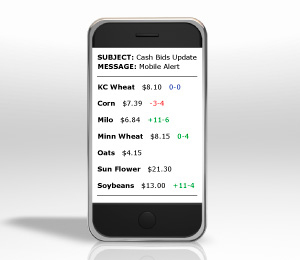 Cash trade reached as high as $130 in NE on Thursday versus $127 the previous week. This was the highest cash trade in the country since March 22. Despite all the positive fundamentals, Thursday's Cattle on Feed report was bearish. Placements were reported at 104.8% versus the average estimate of 103.3%, marketings were seen at 97% versus an average estimate of 96.8%, leaving the on feed number at 102% versus the average estimate at 101.7%. The active placement activity in March will leave the market with ample slaughter supplies down the road, especially given talk of high placement numbers so far for the month of April. For the week ending April 16, speculative funds added nearly 3,700 contracts to their ownership position, pushing managed money net length to a new record position. The best traded Jun live cattle contract traded sharply lower today, testing its 10 and 20-day moving average levels, but was able to bounce into the close. Jun live cattle have not closed below their 10-day moving average since April 3, so technical damage below those levels could lead to some fund liquidation. The best traded Aug feeder cattle contract also tested its 10-day moving average support level today and rallied into the close to limit earlier losses. Aug feeders have not closed below their 10-day moving average since August 3. LEAN HOG HIGHLIGHTS: Hog markets took triple-digit losses today mainly due to technical selling pressure. Jun hogs were down 2.97 to 93.77, Jul hogs were down 2.57 to 97.97, and Aug hogs were down 2.20 to 99.57. The CME Lean Hog Index was up 78 cents to 81.02. Carcass cutout values were down 61 cents by Friday afternoon to 87.24 but were up 46 cents this morning to 87.70. China's spot pig prices have been choppy lately and are likely a source of instability in hog futures markets. Spot pig prices in China were down 0.39% overnight, and are down 3.13% for the month, up 11.5% year to date, and up 46.3% versus a year ago. Jun hogs made their first close below their 20-day moving average support level today since March 4. Today's close is also the lowest since April 2, and a gap between April 2 and April 3 is still a downside target. Jul hogs also made their first close below their 20-day moving average level since March 4, with the April 2 to April 3 gap as a downside target. All Grain Settlements are now completed at the Dysart Office. For your convenience Grain Checks and Contracts may be printed at the Vinton or Clutier locations. THESE HOURS ARE POSTED FOR YOUR CONVENIENCE.SUBJECT TO CHANGE WITHOUT NOTICE. BE PREPARED FOR EARLY CLOSING WITHOUT NOTICE DUE TO WEATHER, FLOODING, OR DOWNTIME.